Utah has many berries growing along the creeks in late August and September, and I thought you might be interested in seeing some of them. The fruit has a sweetish, astringent taste and is fit for human consumption. The fruit makes excellent jellies and jams and is occasionally used for wine. Chokecherry leaves are poisonous, even fatal, to cattle, sheep, and horses, although they usually will not consume the plant unless no other forage is present. The poisoning agent is hydrocyanic (prussic) acid. Native Americans would grind up the fruit, stone included, and store for future use, sometimes mixed with dried meat to make pemmican. Blue Elderberry (Sambucus glauca). The berries are used as food for birds and human delicacies. The berries are somewhat distasteful when green. Ripe berries produce an abundance of sweet juice that is used for jelly, jam, syrup, etc. The whole berries, even though somewhat seedy, make excellent pies. (fresh or dried); stems for tubes, pipes and musical instruments. Some Indians called this plant “the tree of music,” since the smaller twigs and limbs made excellent flutes. Strips from larger limbs made arrow shafts. Flowers were used for external antiseptic washes. All parts of the plant are poisonous. However, Accidental poisoning is not likely since the berries are extremely bitter. The berries are the most toxic part of the plant. A healthy adult will experience poisoning from as few as 6 berries. Ingestion of the berries causes nausea dizziness, increased pulse and severe gastrointestinal discomfort.The toxins can also have an immediate sedative affect on the cardiac muscle tissue possibly leading to cardiac arrest if introduced into the bloodstream. As few as 2 berries may be fatal to a child. Native Americans used the juice from the fruits of various baneberry species to poison arrows. -Wikipedia. Admire these pretty berries from afar! Mountain Snowberry (Symphoricarpos oreophilus). Snowberry occurs on the edges of riparian zones, in woodlands, and in moist areas of the mountain brush zone, at elevations between 4,800 and 10,500 feet. Bearberry (Arctostaphylos uva-ursi), also known as kinnikinnick. 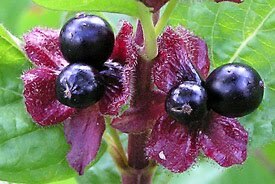 The fruits of kinnikinnick are eaten by songbirds, gamebirds, including five species of grouse and wild turkey, deer, elk, and small mammals. Black bear and grizzly bear eat kinnikinnick fruits in the autumn, but fruits are especially important to bears in the early spring. Smoking the leaves as a tobacco substitute is the most widely mentioned human use of kinnikinnick. The leaves have been used for treating urinary tract disease. They can also be used to make a highly astringent wash and as a vasoconstrictor for the endometrium of the uterus. Some Native American tribes powdered the leaves and applied them to sores. For medical use the leaves are best collected in the fall. To visit an abundance of varied worlds, click here. "How come you guys want me to be still?" says Daisy. "I see something down there. So what if it's 5 miles and 1000 feet down the mountain? It's my job to check it out." To see more cute camera critters, click here. 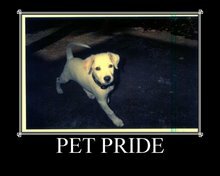 To see more pets to be proud of, click here. The area around the town of Roosevelt is dotted with oil and gas wells. If you enlarge the above photo, you'll see a couple of them in the distance. The petroleum industry provides many jobs in our area when petroleum prices are high. Not so much, though, when prices sink. That makes for a roller-coaster economy. One of our routes through "the Cedars", an arid juniper forest near our home, takes us right up to an active pumping unit. Boss used to be leary of it, but now that it's familiar, he pays little attention to the movement and noise. Mischief doesn't even give it a second look. Depending on our exact route, our "Cedars" rides can be from 6 to 12 miles round trip. As we head home, we can see our small town of Roosevelt in the distance. I hope all of you who celebrate Thanksgiving had a wonderful day and much to be thankful for. Here, we are well fed, clothed, and housed, and grateful for our many blessings. To view a myriad of skies, click here. Pinyon pines grow abundantly in Utah. Spanish explorers in the 1500's called them "pino pinonero", meaning "nut-bearing pine." In our area we have Colorado pinyon, also called two-needle pinyon. In the late fall, the cones open wide, revealing their small seeds. Native Americans gathered these seeds and stored them for winter, and many Utahns enjoy the tradition of collecting and eating them. If the humans aren't quick, though, squirrels, nuthatches and scrub or stellar jays will be happy to munch on them or store them for winter. We gathered some pinyon nuts on a ride in Indian Canyon and took them home. After cracking the shells, only a small nutmeat remains. Raw, they taste like turpentine, but lightly roasted, they have a pleasant, nutty flavor. If you happen to have a pinyon forest near you, I recommend you give them a try. For views and adventures from all around the world, click here. To see more shadow shots, or to enter your shadow, click here. This buck was looking right at us, but he seemed to think he was hidden. He did have pretty good camouflage in the shade. The deer trio knew they'd been spotted and they weren't hanging around for photo ops. It's amazing how effortlessly the doe jumped the fence. To see lots of cute and interesting camera critters, click here. The skies were mostly blue on a recent ride to Baum Lake (just off of the Tworoose Pass Trail, the scene of our recent Wrong Way Janie disorientation debacle). The lake was frozen. Breaking the thick ice to give Daisy and the horses a chance to drink was a challenge. We managed to ride 19 miles and almost 4000 feet elevation gain and loss without misplacing anyone! This was November 10th at 10,500 feet. As you can see, no snow. Everyone seems to be looking a different direction, taking in a different view. Not too shabby, any way you look. For a peek at skies from all over the world, click here. R is for range-ready response. On one of our off -trail rides through rugged riparian zones, a ragged branch ripped my riding regalia. Steve, my ever-ready rough rider in charge, rapidly pulled out the raw material every red-blooded American rowdy refers to in times of emergency: Duct Tape. See (above) how well a few (w)raps resolved the issue? Of course, later, the refined member of our family (me!) released the duct tape with relish, restored the real fabric and reintegrated it into its original symmetry. I'm not even going to go into all the uses for Velcro here, but I will report that they are many and renowned (although perhaps not in a good way). Ready for anything, that's my redneck repairman. He will recycle and reconstruct, rebuild and reclaim, repeatedly reconoiter and research revitalization, whether reasonable or not. Note: Steve is a southern boy with a reputation for never relinquishing anything that might be re-used. I have reluctant but real respect for his ability to rectify and recondition. We enjoyed sunny days and relatively mild temperatures between a snowfall the 3rd week of October and another snow in the mountains last weekend. We took full advantage of it. Even in the high country, snow was melted in open areas. Red Creek Reservoir (at the bottom of the hill in above photo) was our trailhead for one of those Indian summer rides. We traveled up Jones Cabin Creek. At 11AM, the water was still frozen around the edges. All along the little creek, there are numerous signs of past beaver activity. I've marked a couple of old beaver dam outlines in the photo. It's fascinating to see how a valley was sculpted as the dams silted in. We didn't see any intact beaver dams or sign of recent activity. We did see a small herd of deer, though. As we rode past this old cabin, presumably Jones' humble abode, Daisy was ready to move in. The terrain was steep, but the horses are in good shape and had no problem. On Red Creek Mountain's rocky ridge, we let the horses chew on some grass and take a break while the rest of us climbed to the summit. On top of Red Creek Mountain (10,500 ft/3200 m), Steve and Daisy admired the scenery. We know our fall Goldilocks days are numbered, but we'll be out riding a few times a week until the snow covers the landscape for the winter. For lovely glimpses into life all over our planet, click here.